When American Idol premiered back in the summer of 2002, probably no one could have predicted it would last twelve seasons (with no sign of stopping), see copycat shows on nearly every other television network, or single-handedly save a tanking Fox. The first season produced a viable star in Kelly Clarkson, who has gone on to sell over 23 million albums worldwide and ten years after she won the title, had her most successful hit yet last year with “Stonger (What Doesn’t Kill You)”. The show continued to see ratings climb for the next several seasons until it’s peak during season six, when an impressive 37.4 million people tuned in to watch Jordin Sparks take the crown. It also gave us Carrie Underwood in season four, Oscar-winning actress Jennifer Hudson from season three and Chris Daughtry, who placed fourth on season five and went on to form the multi-platinum selling band, Daughtry. There’s no arguing the importance the show has played in pop culture and without it, Kelly Clarkson might still be waiting tables in L.A., but after twelve seasons, it’s time to shut the machine down. The first few hiccups came when the show’s producers decided to introduce new faces to the judging panel. In season eight, a fourth judge was added and songwriter/music producer Kara DioGuardi joined Randy Jackson, Paula Abdul and Simon Cowell at the judges table. Paula left at the end of season eight and was replaced by Ellen Degeneres, who only stayed one season and along with Simon Cowell, departed at the end of season nine. Simon and Ellen were subsequently replaced by Jennifer Lopez and Steven Tyler, who did nothing more than use the show as a platform to re-energize their dwindling careers – a move that surprisingly worked, propelling J-Lo back to the top of the charts and making a best-selling author out of Steven Tyler. A win for the two judges, but a huge misstep for the show. Mariah Carey, like her predecessors, seems to be using the Idol stage as a way to be seen and heard again in the mainstream music scene. She offers nothing useful to the contestants and most of her comments are so convoluted that viewers have no idea what she’s really trying to say. Expect her to only stick around for one season. Keith Urban, while nice enough, needs to be tougher on contestants. He’s actually a pretty good choice as a judge, but plays it safe and rarely criticizes anyone other than on their song choices. His next tour kicks off this summer and goes well in to fall and right around audition time for next season, so it’s a pretty safe bet to assume he’s a one-season judge too. Surprisingly, the only breath of fresh air this season is Nicki Minaj. While she may have one of the most annoying personalities ever, she’s usually spot on with her opinions of the contestants performances. She tells them what they did right, what needs improvement and spares no one when she dislikes something. Unfortunately, everything else about the show is formulaic and doesn’t stray much from the first season. We still have the same old “theme” nights, where contestants are forced to sing country songs, Beatles songs, songs from the movies and songs that topped the charts the year they were born. If a contestant doesn’t change the song enough, it’s too predictable. If they change it too much, they should have stuck with the original melody. Why not let the contestants pick any song, from any genre, so the audience can get a better feel for what kind of artist they really want to be? Instead, we’re left hearing the same songs year after year, which makes for a very boring, predictable two hours. Results night is still painfully drawn out – how long does it really take to sort everyone in to the bottom 3 and tell us who goes home? Not long at all, but when you work in non-Idol related performers every week so they can shamelessly promote their new albums, it turns into at least an hour long process. Two, if it’s finale night. And really Ryan Seacrest, don’t you think the viewers know by now that you won’t really reveal anything important until “after the break”? To his credit though, he’s the best reality TV show host by a long shot (see either season of The X Factor for an example of how not to host a television show). It’s also lost a lot of its “fun” factor too – remember the days of sending thousands of text messages to vote for your favorite? Now, the super vote, which casts 50 votes at a time through a Facebook app, takes care of that. It probably also serves the purpose of skewing the voting numbers so Fox executives can boast record breaking numbers each season to make it seem like the show is still as popular as ever. Of the eleven Idol winners, only five still have record deals. Season nine winner Lee DeWyze was dropped from his label a year later after he won. So if the show can’t produce lasting artists like they claim, what is the whole point of the competition in the first place? 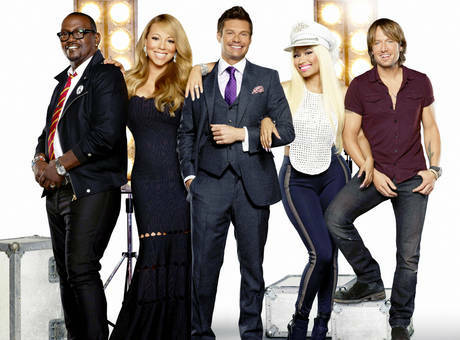 American Idol’s focus seems to have shifted away from the contestants and more toward attracting viewers who tune in to see the antics of high profile celebrity judges. It’s lost it’s purpose and for that reason, it’s time to say goodbye to an old favorite.